The Lunch POD is a convenient way to take a healthy sandwich entree or snack with you. 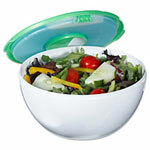 The compact size allows you to pack this container in almost any lunchbox, bag, or briefcase. 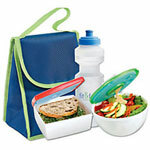 Top cover provides a tight seal to keep food fresh. Removable ice pack snaps into the lid to keep food fresh and chilled until you're ready to eat. Bottom compartment holds up to 2.65 cups of food. Easy to clean, freezer, microwave and top rack dishwasher safe, except for the ice pack. Do not microwave the ice pack. Meets FDA regulations for food grade plastic. BPA free. Measures 5 5/8 in l x 5 3/8 in w x 2 3/8 in h.